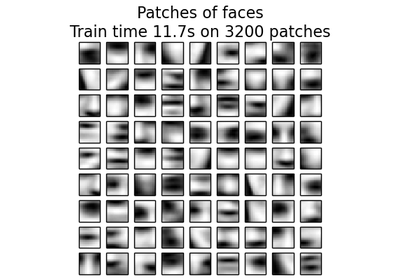 Maximum number of iterations over the complete dataset before stopping independently of any early stopping criterion heuristics. Control early stopping based on the consecutive number of mini batches that does not yield an improvement on the smoothed inertia. To disable convergence detection based on inertia, set max_no_improvement to None. 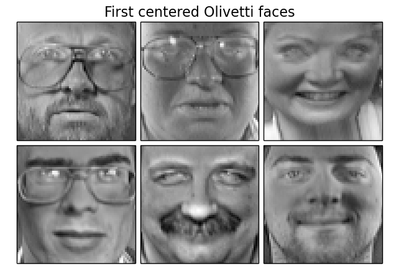 Control early stopping based on the relative center changes as measured by a smoothed, variance-normalized of the mean center squared position changes. This early stopping heuristics is closer to the one used for the batch variant of the algorithms but induces a slight computational and memory overhead over the inertia heuristic. To disable convergence detection based on normalized center change, set tol to 0.0 (default). Size of the mini batches. Number of samples to randomly sample for speeding up the initialization (sometimes at the expense of accuracy): the only algorithm is initialized by running a batch KMeans on a random subset of the data. This needs to be larger than k.
Number of random initializations that are tried. 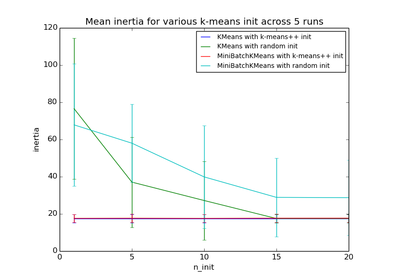 In contrast to KMeans, the algorithm is only run once, using the best of the n_init initializations as measured by inertia. Compute label assignment and inertia for the complete dataset once the minibatch optimization has converged in fit. The generator used to initialize the centers. If an integer is given, it fixes the seed. Defaults to the global numpy random number generator. Control the fraction of the maximum number of counts for a center to be reassigned. 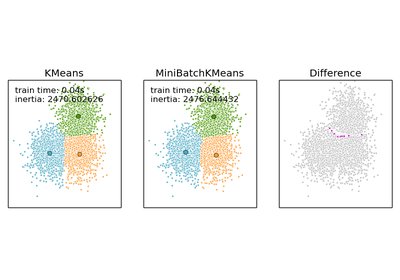 A higher value means that low count centers are more easily reassigned, which means that the model will take longer to converge, but should converge in a better clustering. Labels of each point (if compute_labels is set to True). The value of the inertia criterion associated with the chosen partition (if compute_labels is set to True). The inertia is defined as the sum of square distances of samples to their nearest neighbor. fit(X[, y]) Compute the centroids on X by chunking it into mini-batches. fit_predict(X) Compute cluster centers and predict cluster index for each sample. 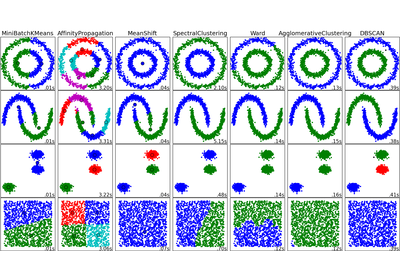 fit_transform(X[, y]) Compute clustering and transform X to cluster-distance space. 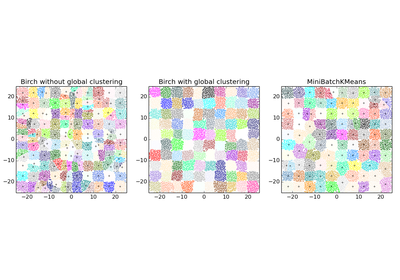 partial_fit(X[, y]) Update k means estimate on a single mini-batch X.
predict(X) Predict the closest cluster each sample in X belongs to. score(X) Opposite of the value of X on the K-means objective. transform(X[, y]) Transform X to a cluster-distance space. Compute the centroids on X by chunking it into mini-batches. Update k means estimate on a single mini-batch X.